When I have some down-time, I often like to look through a few of the blogs of other EWB volunteers. Their experiences feel familiar, yet incredibly unique. In contexts that are superficially alike but truly quite distinct, we are inevitably faced with similar, yet utterly different challenges. Most importantly, each of us sees his reality through his own eyes, and lives it in her own way. Their perspectives enrich my own understanding and complete my experience. Today, Alyssa and Anthony caught me completely off guard. Their honest yet powerful tales of loss reminded me of Seydou’s youngest daughter, who probably had malaria when I left Kayero. I say “probably” because a medical diagnosis was, to my knowledge, not made; instead, Seydou’s diagnosis was based on her fever and vomiting. Fortunately, basic malaria treatment was expensive but affordable and, most importantly, available in Kayero; if she was able to ingest the pills, there is good reason to believe that Seydou’s daughter is okay today. Kayero, however, is relatively lucky. The pharmacy and clinic there must also somehow serve most of the surrounding villages, all several kilometres away. So it is also for the centre for malnourished children (CREN), that receives dozens of young children from the other villages, and generally none from Kayero itself. 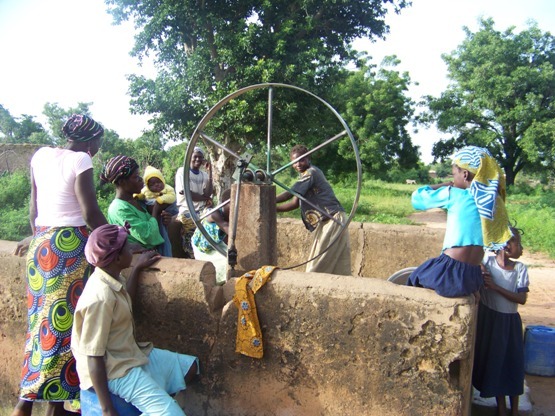 One of two pumps in Kayero -- it's hard work! Kayero seems to owe its improved situation to a multi-faceted development project by the Christian Relief and Development Organisation (CREDO) a few years back. They built and serviced the pharmacy, the clinic, a school, a church and the CREN, developed some basic irrigation and installed two bore holes with pumps. Fifteen years later, the first three have been taken over by the state and are functioning relatively well, the church is closed off (Christianity didn’t take, most of Kayero is still Muslim), accumulated water is a bit more accessible for the fields, and clean drinking water is still easily available, for now. The CREN, however, continues to operate almost entirely thanks to the CREDO’s funding, funding which will be cut in 2011. It’s not clear what will happen to the malnourished children after that. In development work, it’s easy to get lost in the How. It’s such a difficult question to answer that getting lost in it may even sometimes be necessary. The question of Why, though, may be an even more difficult one. It’s especially challenging when these two questions feel at odds. For me, the conflict is felt when trying to evaluate whether the CREDO’s development project was “Good Development”. It certainly was not in line with EWB’s approach. The overwhelming attitude I sensed in Kayero was one of waiting for development to happen. “When is the next project coming along? We need help to be able to develop. We don’t have the means.”; “You are Canadian. How is Canada going to help us develop? Now that you have come here, how are you going to help us?” What do you answer to that? … What brought them to ask those questions in the first place? Is it an endless list of development projects like the CREDO’s? Is it truly possible for a country to develop with that attitude? At the same time, the CREDO’s project has done undeniable good. Clean water has meant less diseases for 15 years. Medical services means being able to treat many of the diseases that do appear, like malaria. Irrigation means more productive fields. A functional elementary school means children who can read, write and speak French, which they need to be able to professionalize themselves. And the state taking a number of these over also means some encouraging sustainability. How would I feel if Seydou’s daughter died because of an easily treatable disease? How can I possibly say that this is “Bad Development”? So, Why? 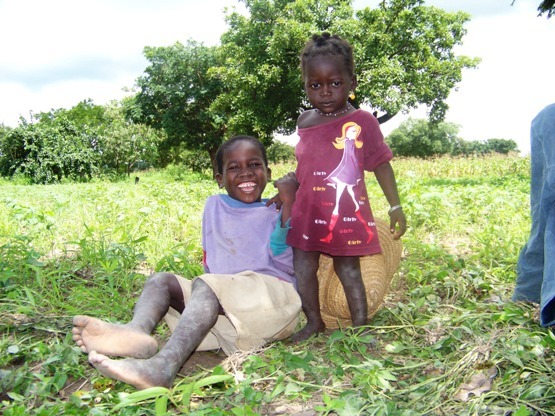 Are we working so that Seydou’s daughter can be treated for malaria? Or is it something else? When does development start to look more like charity, and when does that become acceptable, if ever? Why do you think I should be here? Or do you think I should even be here at all? This entry was posted in EWB & Development, Personal beliefs and tagged development, EWB. Bookmark the permalink. 5 Responses to Good Development – How? Why? Happy 25th birthday from all of us!!!!! Hope you are well. As you may or may not know, I have supported foster children in developing/third world countries for almost 40 years; first with Foster Parents Plan of Canada and presently through World Vision. I have included the information below from their site as it outlines their philosophy toward helping other countries. (Better in their words than mine.) My belief is that charity and development can go hand-in-hand. I believe that it is always best to teach a man to fish rather than to provide the fish, but that he must receive support during the learning process. You are certainly making a contribution to the people of Burkina Faso. It may not be felt for years to come, but our actions do impact whether we see it or not. Just your being there, Dana, gives them hope. We must realize that it is all baby steps – countries like Burkina Faso will never catch up to countries like Canada but can certainly look forward to continued development and improvement through support and education from organizations such as EWB, CREDO, etc. Take care. We will celebrate your b-day when you get home. Transformational development helps empower children, families and communities to identify and overcome obstacles that prevent them from living a full life. World Vision seeks to enable the people in the communities we serve to enjoy the fullness of life with justice, dignity, peace and hope. ADPs are child-focused, sustainable development programs for between 15,000 to 100,000 people, divided into smaller community clusters. Generally, World Vision works with communities through ADPs for 10 to 15 years. Facilitators, who are usually from the region, are trained to build relationships, help the community to identify needs and possible solutions, provide training to local leaders and encourage networking among civil society and government groups. The first, same as for Bert: does my presence really give them hope, as you say, or is it just another indication that reinforces that help can only come from outside (the West in particular) rather than from within? Second: should Burkina Faso really be trying to ‘catch up’? Or is it something else? Why are we trying so hard to make them like us? Lastly: what happens when the fish run out, or the river runs dry, or the rod breaks? Does the man turn to us to ask how to hunt? Is teaching to fish really that different than giving fish? Or do we need to teach the man that the solution can’t come from the outside, whether it be teaching to fish or just giving fish. How do you teach that? Can you? Should you? Waiting for development to happen is a reality that has to be changed, which is in my view part of your role, give them the tools on how. As for the necessary resources, they’ll have to come from somewhere else. A problem seems to come from the aspect that international help is not distributed as to help the population in view of what you explained about what you saw in Kayero village previously. I wonder if EWB can have an influence on this distribution or inquire on it so that it may be used in conjugation to EWB’s mission and why EWB has placed you there. I think the ‘why’ of your presence there makes more sense because you can provide the ‘how’ instead of just bringing/giving materials, build and leave without giving knowledge on how to grow. Like Cynthia previously mentioned, it’s all baby steps and your presence gives them hope. The challenge I perceive in your task is to stop the wait-and-see and dependence the inhabitants seem to show. I hope you are doing well! You haven’t posted in a while. Hey Bert, thanks for taking the time to think about development. There’s too much to say in a short comment, but here is some food for thought: does my presence really give them hope, as you say, or is it just another indication that reinforces that help can only come from outside (the West in particular) rather than from within?